In our history of the use of colour in silent cinema, there has been probably disproportionate emphasis on Kinemacolor. The first ‘true’ colour system it may have been, and importantly technically and in perceptions of cinema it undoubtedly was, yet was only ever witnessed by a minority. Kinemacolor featured in select theatres which had installed the necessary projection equipment, but in the ordinary cinemas and movie houses it did not feature. The mass early cinema audience, where it saw colour – and it often did – did so in the form of tinting and toning. 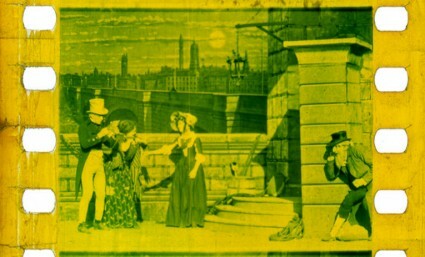 As the film industry expanded through the 1900s, and as mass production of prints ensued, stencil colouring (that is, applying artificial colours onto the print using stencil cut-outs and a pantograph system) became a speciality, reserved for historical dramas, exotic travelogues and films with a strong fantasy element, and predominantly the preserve of the Gaumont and Pathé multinationals. Such films also commended higher prices, and once films began to extend in length beyond 1,000 feet they became no longer economically feasible (bar the occasional deluxe exception). For most other, so-called monochrome films, colour tinting and/or toning were widely employed to lift them from the mean appearance of black and white. Though there examples of just the one tint being used throughout a film, it was more common for different colour tints to be employed, enhancing the drama and varieties of mood. 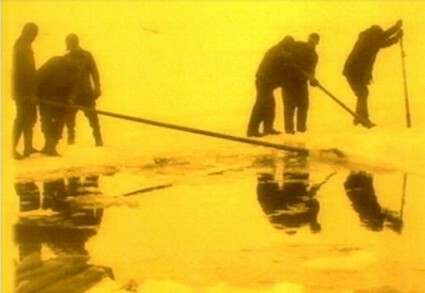 By the start of the 1920s, the large majority of films were exhibited with colour tinting. Even newsreels were commonly seen in tinted colours. Tinting and toning continued as the main means of putting colour before audiences throughout the rest of the silent era. The arrival of sound caused problems, as colour tinting interfered with the sound reproduction, chiefly by absorbing too much of the light that the photocell required to reproduce the sound. Although adapted tinted stocks were produced, and continued in some cases to be used well into the sound era, essentially tinting and toning for films were no more. The accurate and sensitive reproduction of tinting and toning effects for silent films is a major part of the restoration work undertaken by film archives, and there is much delight taken in the finest results. The Nederlands Filmmuseum, for instance, has built up a worldwide reputation for some of its exquisite colour work on early films. Prestigious silent DVD releases now highlight faithfulness to original tinting and toning. On the other side, and mentioning no names, there have been some real horror stories presented at some silent film festivals, where garish colours grossly applied shock you with their thoughtless vulgarity. It is not, and never was, colour for its own sake, but rather colour for the film’s sake. As with musical accompaniment, decoration had always to be subservient to the drama it was there to enhance. The outpouring of colour viewing prints of early films (in past years, some archives regrettably had to economise by producing viewing prints in monochrome, even though the originals they were working from were tinted) has in turn encouraged an enthusiastic literature on the aesthetics of colour in silent film. Kinemacolor, interestingly enough, tends not to be discussed so much in such works, owing to the lack of viewing prints. 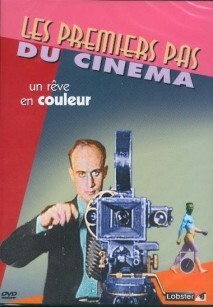 Examples include Daan Hertogs and Nico de Klerk, Disorderly Order: Colours in Silent Films (1996), a special issue of the Italian journal Fotogenia, two essays from which (including a key work by Tom Gunning) are available online in English, and a special issue on colour of the journal Living Pictures (vol. 2 no. 2, 2003), edited by yours truly, which is now alas rather difficult to find. Probably the best text available on tinting and toning in early film, with illustrations, is Paolo Cherchi Usai’s Silent Cinema. For a rich selection of examples of early colour films – not just tinted and toned films, but Kinemacolor, Prizmacolor, Technicolor and other such processes – Lobster Films has created a marvellous DVD, which is available in the UK from the Projection Box in the 2-DVD set The Birth of Sound and Colour as A Dream of Colour, in the USA from Flicker Alley as Movies Dream in Colour, one half of the Discovering Cinema set, and in Germany from Edition Filmmuseum as part of The First Steps of Cinema set. Under whatever title you find it, it is warmly recommended.